Hello! You may have noticed we are not publishing any posts to this blog anymore. 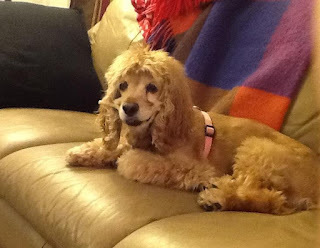 We have been including articles on our website (www.cockerspanielrescue.com) and we are posting happy tails and rainbow bridge posts to our Facebook page (@OBGCockerRescue). Please send your Happy Tails with photos and text to Facebook@cockerspanielrescue.com. 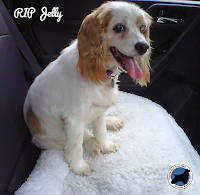 Please send any In Memoriam posts with photos to RainbowBridge@cockerspanielrescue.com. Thanks and love to all our OBG wigglebutts! We lost another member of the OBG family this holiday season. On December 21, Amber Churchill, a 2004 alum, went to the Rainbow Bridge surrounded by her family. We are so sorry for their loss. Such a beautiful girl. Run free, sweet Amber. We had to put down our sweet girl today. We adopted her 12 years ago this coming April. She turned 16 in September of this year. She lived a long and much loved life. We will miss her so much! I am thankful to still have Jack (9 years) and Zander (few months). Jack will really miss his companion! Amber had such a sweet disposition and was such a good girl. She showed so much expression in her eyes. We knew that this day was coming, but it did not make it any easier. I will really miss my constant companion that followed me all over the house and at times was attached to my leg on the couch and in the bed. I will miss her presence so much! Thanks for the opportunity to adopt our sweet dogs! We love them and we will miss our little girl! Have you hung up your stockings up by the chimney with care? OBG foster dogs have stockings too, but no where permanently to hang them yet. Fifty-nine OBG foster pups are waiting for forever families (See them here) and 15 more are in vet kennels either undergoing medical vetting or waiting for foster homes to open. Every OBG foster dog deserves to have their stocking filled this holiday season! 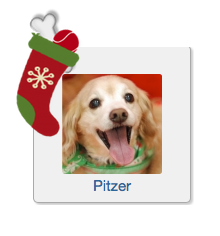 For a $20 donation, your favorite pup will receive a "stocking filled with love"‬ on their picture like Pitzer and any special message you would like to leave on his/her bio page. Give as many gifts as you like! Click here to fill your favorite foster dog's stocking. Thank you on behalf of the pups! Our ‪#‎GivingTuesday‬ spokesdog, Muffin Man, says THANK YOU for all your donations yesterday. You are A-M-A-Z-I-N-G! We met the $10,000 Mini Match so that's $20,000 for OBG's pups!! Donations are still coming in so stay tuned for the final one day number. We are humbled by the kind words and generous donations to OBG! We have 15 new dogs coming to OBG shortly and we continue to receive multiple daily requests to help others. We will be able to help many more dogs because of YOU! Our Holiday Fund Drive continues throughout the month so there is still time to donate: If you have a PayPal account, donate here and the PayPal Giving Fund will waive the processing fee. And we always welcome checks: Mail to OBG Cocker Rescue, Box 30821, Bethesda, MD 20824. Thank you again. ‪OBG Supporters Rock‬! P.S. - Muffin Man had his postop check up yesterday and got his cone off. :-) But the great news, the cataract surgery was successful and he can see!! What beautiful eyes! He is available for adoption and will be at our Adoption Show in Springfield, VA (Pet Valu) on Saturday. Learn more about him on his bio page - click here! #GivingTuesday - Donate to OBG TODAY! Today is #GivingTuesday, an international day of charitable giving and the kickoff of OBG's Holiday Fund Drive. To jump start our drive, a group of generous donors has pledged $10,000 in matching funds. That's $20,000 for OBG's pups! Let's do it! 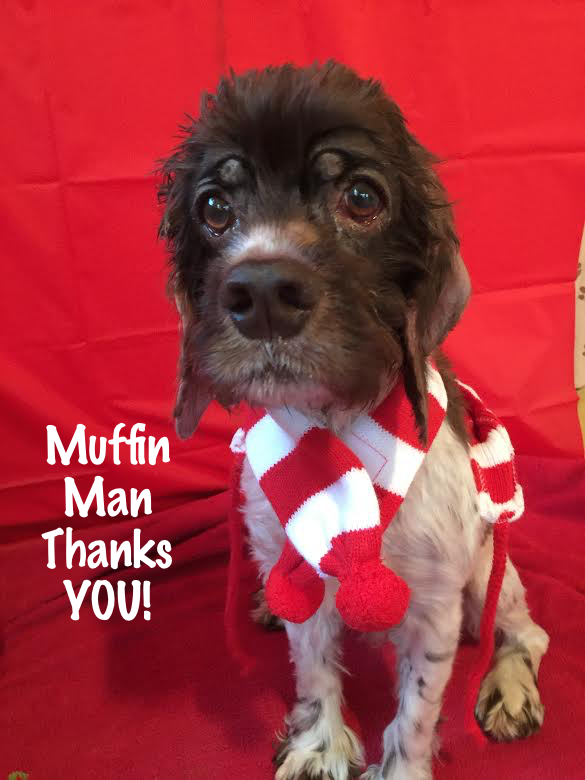 Meet Muffin Man, our #GivingTuesday spokesdog. He is about 5 years old and came to OBG from a Virginia shelter. He had been found as a stray in a matted, filthy, flea-covered mess. Check out his poor ears with almost NO fur! He also had open sores from the shave-down that was necessary. 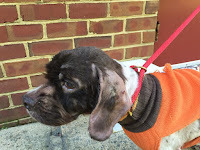 Initial diagnosis was sarcoptic mange and he tested positive for Lyme Disease too. Upon arrival to our intake vet, we also learned he had cataracts in both eyes and was blind. 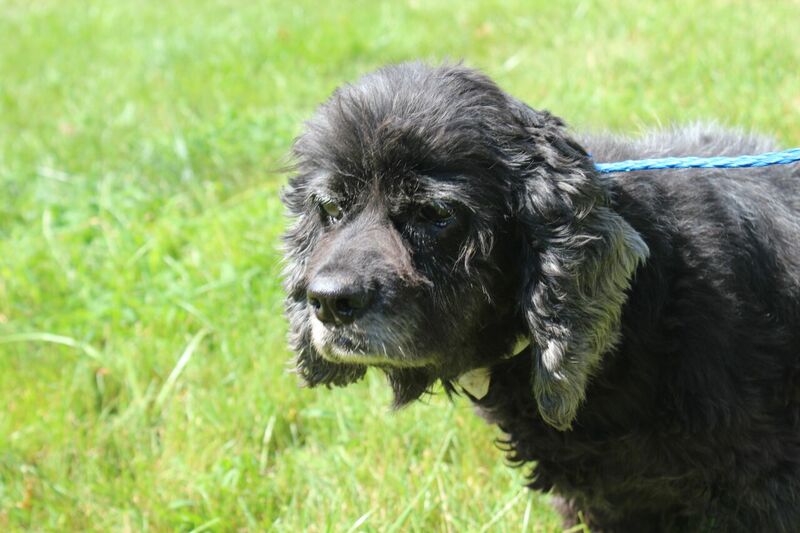 Please consider donating TODAY to help pay for Muffin Man's medical expenses including double cataract surgery. Total expenses have already exceeded $2500. In honor of #GivingTuesday, PayPal's Giving Fund will donate 1% in addition to your donation and there is no processing fee so if you have a PayPal account, please donate through this link! If you wish to donate by credit card, please click here to donate online now. You will be directed to PayPal, but can choose credit card to make your donation. 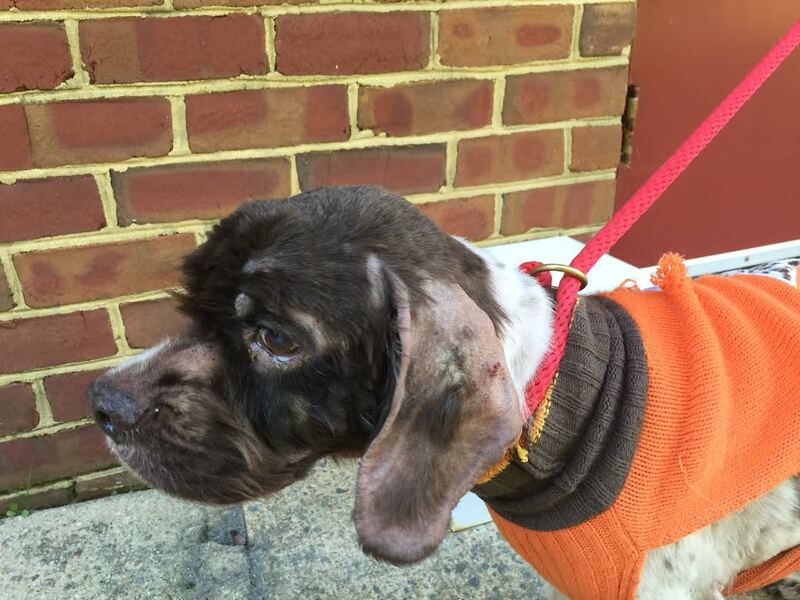 You may also send a check to OBG Cocker Rescue, Box 30821, Bethesda, MD 20824. 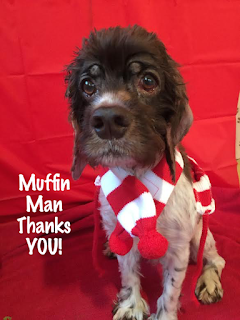 Thank you your support to Muffin Man and all of OBG's pups. No donation is too small! All donations will be matched up to $10,000. Help us raise $20,000 for OBG's dogs! OBG's 2016 Calendar is Here! It's HERE! OBG's 2016 ‪Sweetest Things‬ calendar is on sale now! Congratulations to OBG alum, Jasmine, Class of 2005, who graces the 2016 cover with her beauty. We also have a special page honoring the ‪Freedom 46‬ and all who helped rescue them. The year is chock full of adorable fur faces to bring a smile to every month. Celebrate OBG's 20th Anniversary and place your order today. Click here and hurry, we know they are going to fly off the shelf. $20 per calendar plus shipping. Sending as a gift? We will include a small gift card with your message. Special thanks to Casey Shaw for her beautiful work on the calendar. Thanks for supporting OBG's pups! It's hard to believe it has been three months since OBG rescued 46 dogs from a hot barn in rural Virginia (click here for a link to the original email with their story). Soon our 46 became 53 as we rescued an additional seven dogs that had originally been part of the group of dogs at the barn but had been moved to other locations including local shelters before OBG arrived on July 25th. Please read on for a short update on these dogs and those Freedom 46 dogs still waiting for foster homes and forward this email to anyone who might be able to help. This should include other rescues, if you have contacts with any rescue that might be able to assist. If you or anyone you know is interested in fostering one of these dogs, please email volunteer@cockerspanielrescue.com. The good news is 17 have found their forever homes and 16 are currently in foster homes (see our Dogs Available page)! * Those dogs are now living the good life with not only basic care, but also healthy doses of daily spoiling. Sadly, not all of the news has been good. OBG is in mourning over sweet Jelly. She was thriving in her foster home and her foster parents had just decided to adopt her when she passed away unexpectedly a few nights later. Her story from Korean meat market to the "barn" and finally into the loving care of OBG is incredible. OBG will be sharing her story in detail in the weeks to come. May she rest in peace. One of my favorite expressions is "in for a penny, in for a pound" and that was definitely my motto during the entire Freedom 46 rescue. Once OBG decided to help these dogs, we made the decision to help ALL of the dogs, no matter what. OBG knew there was a risk we would get dogs that had issues with other dogs or health or temperament issues, but decided to take them anyway to rescue them from the horrible conditions they were living in every day. Please read on to learn more about the Freedom 46 dogs that still need YOUR help. They have been stuck in our kennels for two months now. I have so many wonderful updates to share with you today. First, the Matching Fund Drive has grown to $38,000 thanks to our very generous donors. With your help, we have the potential to raise $76,000 for OBG's pups. These funds are desperately needed between the Freedom 46 expenses and two new dogs whose combined surgeries total $8,200 (see their stories below)! The drive runs through Monday, August 31st and we currently have raised over $32,325! Please help us reach our goal by Monday! Click here to donate! Second, the Freedom 46 pups just celebrated one month of freedom and there is much good news to report. The original group of 46, which grew to 52, has grown again to 53 with the addition of Ginger last week. She was surrendered to OBG by the same rescue group who ran the barn. Ginger is young and friendly, but heart worm positive. She has a foster lined up to help her get through her heartworm treatment and then on to a forever home. I'm so happy to tell you the first of the Freedom 46 pups have gone to their forever homes -- Angus (now Crockett), Lulu, and Royal. Eighteen more have gone to foster homes and nine have been transferred to other rescue groups who offered to help OBG. The rest are waiting for foster homes and or medical treatment. Special thanks to all the staff at Hayfield Animal Hospital, Crosspointe Animal Hospital, and Deepwood Veterinary Clinic for the great care, love and attention you have shown the Freedom 46 and all of OBG's pups. Come join OBG on Sunday, September 13th from 12-4pm for a beautiful fall afternoon with your fur-friends at Barrel Oak Winery in Virginia's gorgeous wine country. Enjoy a Barrel Oak wine tasting, plus light snacks and sweet treats (including some for your furry companions), and a chance to win some fantastic raffle items. Tickets are $25 per person and include one wine tasting, food, treats, and one free raffle ticket per guest. Additional raffle tickets may be purchased. Proceeds will benefit OBG's pups! 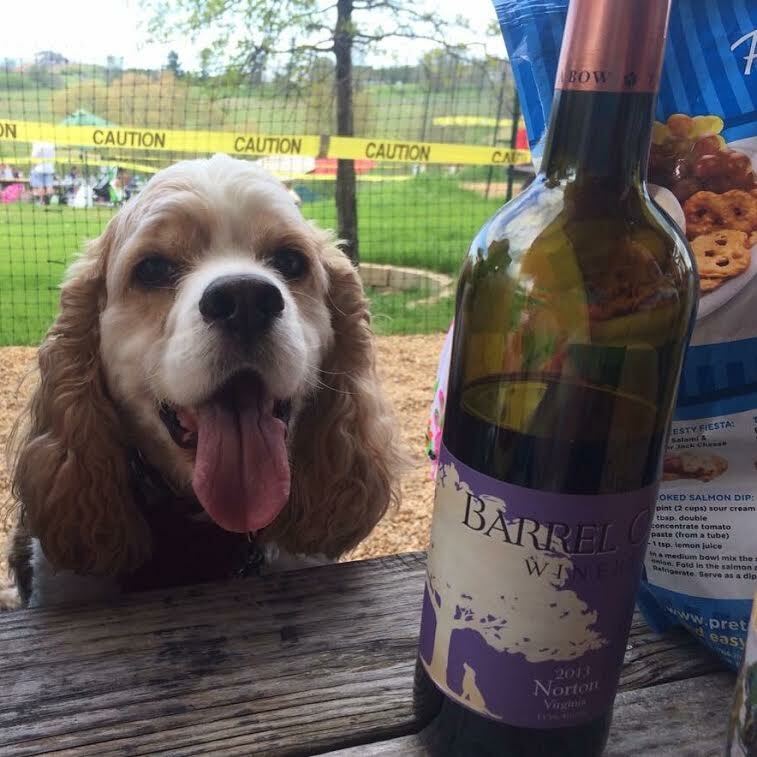 Barrel Oak is a dog-friendly environment. All pups welcome, but please do not bring flex leashes. Rain or Shine (we'll be inside if rain). Click here to register and buy your tickets now. Hope to see you on September 13th! Sweet Missy in the yard at our vet's office this week. Today marks two weeks since Team OBG drove down to the hot Virginia barn where 46 dogs were being housed with out proper food, water, exercise and ventilation. It's been an amazing two weeks for OBG and all the dogs. The outpouring of support from around the country and the world has been inspiring. All the dogs have been evaluated and are getting much needed medical attention. 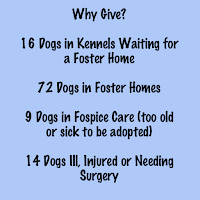 I'm very pleased to also tell you several of the Freedom 46 dogs are now in foster homes. Watch our Dogs Available Page and our Facebook page for updates. Many of you have expressed interest in the Freedom 46 and have asked how you can help with their care. 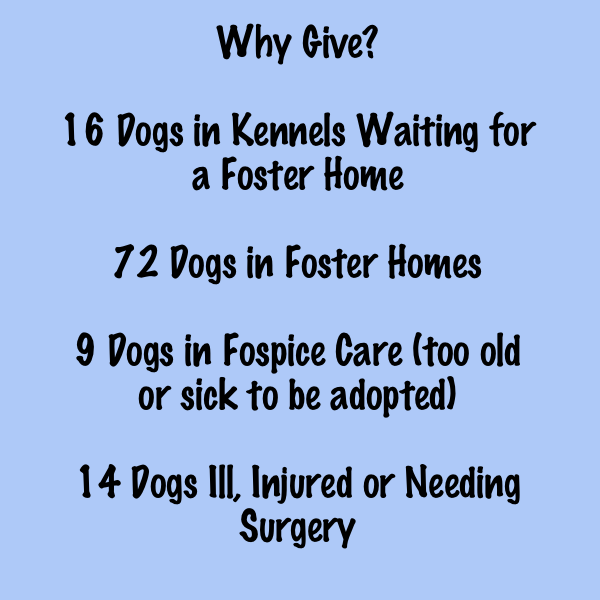 OBG's two primary needs to care for all these dogs are foster homes and donations. 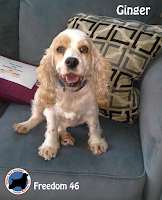 If you are interested in fostering for OBG, please contact volunteer@cockerspanielrescue.com. While more of the Freedom 46 dogs are headed to foster homes in the coming days, there are many more waiting including Sweet Missy. See a link to her story below.